2.0 is the story of Chitti the primary protagonist and antagonist of the super-hit Tamil movie of 2010 Enthiran (Robot in Hindi). Chitti is an android robot that behaves according to his programming that first makes him a hero and then a villain. In the end, Chitti is dismantled to display in a museum. Dr. Vaseegaran (Rajinikanth) and his new assistant, robot Nila (Amy Jackson) have a new assignment. Mobile towers in the city are destroyed and the phones are disappearing in the sky. Dr. Vaseegaran finds sees a giant bird with feathers made of mobiles is destroying the mobile towers. Soon it is found that it is Pakshi Raja (Akshay Kumar) who has come to rescue the birds from mobile tower radiation. Dr. Vaseegaran is quick to understand that Nila is no match for the giant bird. He needs to bring Chitti back to life for his job. The most impressive poster ever dropped, it contains Chitti of Enthiran, Nila the new robot and the evil Pakshi Raja. 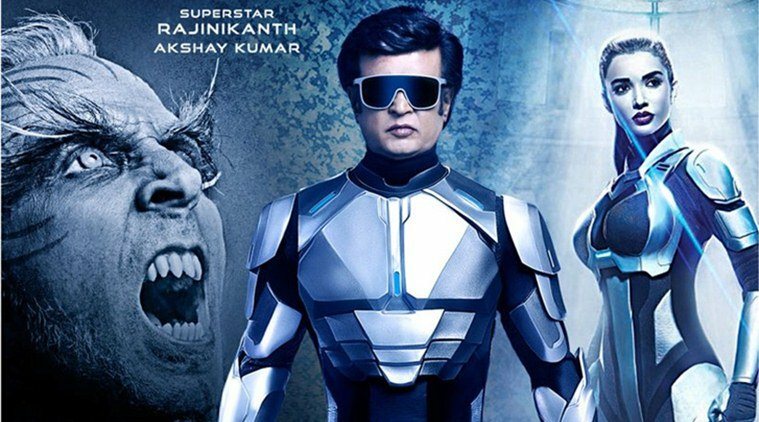 Rajinikanth looks quite young in the dress of Chitti; Amy Jackson also dons the dress of a robot but it is Akshay Kumar that holds the attention with his evil eyes. There are many reasons to watch the movie. It is the biggest movie of the year and the most expensive movie ever made. Also, it has Rajinikanth and Akshay Kumar. The VFX and 3D effects of the movie are stunning.